The Tithe Barn had reed thatching at the back; at the front and on the ends it was straw thatching. 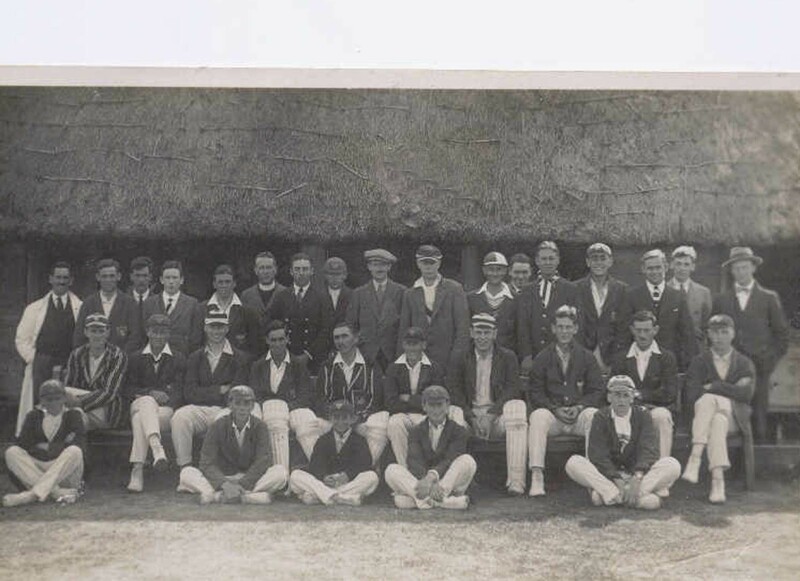 Reed thatching was good enough to last a century; there were a couple of re-thatchings of the straw in Mr. Plewis’s time there (1921-71) The Tithe Barn’s dimensions were 70 feet by 30 feet. It was built of elm, elm lasts but cannot be “mucked about with” and so it could not be dismantled and rebuilt at Singletons or elsewhere. 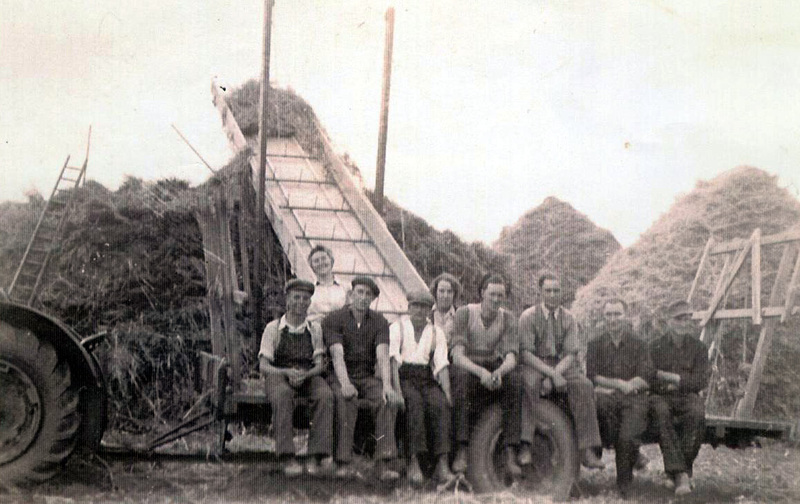 The last new wagon was built at the tithe barn in 1930, and repairs carried on until the end of the Second World War. Wheel wrighting was deteriorating during Mr. Plewis’s apprenticeship. He took over from Mr. Harryman who retired in 1930. Charles Bloomfield, who was also an apprentice, brought up the business. Bloomfield had two other wheel wrighting businesses elsewhere, and sold one of them to purchase the High Halstow business. The Revd. S.G Davidson said that he hoped Mr. Plewis was not going to pass the tithe barn workshop on to his chap on his retirement, as the church wanted to sell it. Mr. Plewis felt that the Revd Davidson was under pressure from the diocese to dispose of the barn and land. Mr Plewis got rid of the “two-handed” jobs the year before and was due to retire, so that his chap would have the opportunity to look round for another position, and spent the final year finishing “single- handed” jobs and generally running things down. The three ponds in Christmas Lane were connected with the pond in the tithe barn. Water ran from Christmas Lane in the direction of Jubilee Cottages, where it was drained away. St. Margaret’s Court was built bang on the site of the pond. On occasions when the village pump dried up, the parson would go with horse and cart to Lipwell and fetch barrels of water to sell to the villagers. Mains water came to High Halstow in 1909 (*see cast iron cover outside village shop for date), it wasc1915 before mains water extended to the farther cottages in the village). Among the odds and ends in Mr. Plewis’s workshop were window sashes with mahogany bars, said to be from Bessie’s hall (Elizabeth Hall). They had very elaborate beading. The church brasses were found tucked away in the workshop in Mr. Harryman’s time. Mr Plewis supposes that must have come in at some time to be mounted on a board, and then put to one side until they had been completely forgotten about. Mr. Henry Victor Scales, School teacher, moved to Stoke from High Halstow. He would pick up the cane first thing in the morning, and not put it down till the end of the day. His trouser-ends were frayed from his habit of constantly flicking them with the cane. He wore a black jacket and tight trousers. He had one son – Monty _ who went to the Argentine working as an engineer for Thorney-crofts, and was killed there in an explosion. He had two daughters – Norah who married an army officer, and Katharine, who remained unmarried and moved with the family to Groombridge. Mr. Baskin followed Mr. Scales as a teacher at High Halstow. He was Irish, but a good teacher. He would lay children across his desk and beat them. After his retirement he had a letter form a Bance, a chief of Police in the USA, thanking him for his strict discipline, which he said made him what he was. Main crop farmers grew potatoes, corn crop, cereals, seeds (canary, radish, linseed). Only small holders grew beetroot and things. It is now cheaper to import the seed crops. Mr. Plewis’ s father and grandfather worked locally in similar trades, mending fences etc in the winter months. Mr. Plewis thinks that one of his ancestors, a John ap Lewis, was a drover who drove sheep from Wales, using the Hoo Peninsula as a grazing area for fattening livestock before selling it in the London market. Possibly that was how the ap Lewises settled there. George Jewell, now a tall, sprightly 81 year old gentleman who is often seen strolling through our village, High Halstow, with his dog ‘Honey’. has lived here all his life. Among his fond memories is a photo taken in the Summer of 1946, less than a year after the end of the 2nd. World War. 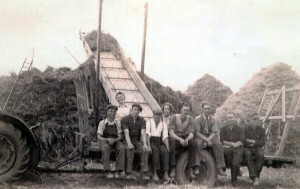 It shows him as a strapping 20 year old farm hand, with other farm hands, land army girls and German prisoners of war, harvesting down towards High Halstow marshes. They were all working for Hill Farm (now Hill Farm Close, Christmas Lane) the photograph being taken by their boss, Brian Rayner. But to George Jewell this event was but a tragic coincidence to another Geoffrey, father and son, and another deHavilland aircraft. In 1938, as a 12 year old leaving with his school pals from High Halstow school, they saw an aircraft overhead, and an old boy of the school, stunting and mock dive bombing them in an RAF deHavilland designed aircraft. Their headmaster, Mr. Bastin, was not amused and complained bitterly to the Rector of St Margaret’s Church, the Rev Geoffrey Longfield (Longfield Close). For they all guessed that the pilot was his son, Geoffrey Longfield, a lively and energetic offspring of our village. Squadron Leader Geoffrey Phelps Longfield, 27220 RAFVR, 105 (Bomber) Squadron, Royal Air force, died 22nd February, 1943, aged 33 years, killed by enemy action whilst leading his wing on a mission. He is buried at Rennes Communal Cemetery, France. R.I.P. The dramatic opening setting of ‘Great Expectations’, possibly the best loved novel by Charles Dickens, is often claimed as set in the churchyard of St James, Cooling, although some disputed that the area was Higham church. 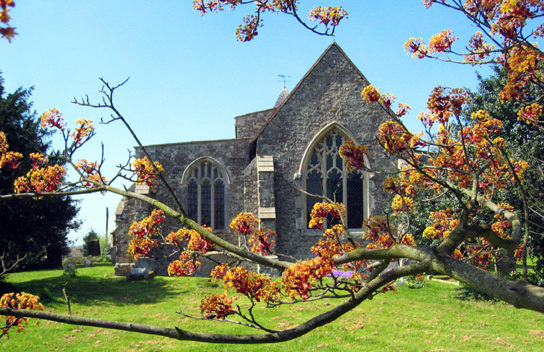 Yet to us who live in our beautiful village, are familiar with our Church – St Margarets, our countryside, and some local history, High Halstow (Home of the Heron) was the obvious inspiration. Higham church has a spire. Is close to the marshes and the Thames. Had a blacksmiths forge – Forge Lane, and was a favourite area of the great man. High Halstow Church has no spire – now. However maps of the 18th Century, and earlier, show a magnificent spire. Later struck by lightening, demolished and the tower rebuilt by the Victorians. There was a forge nearby, about the site of our present school, and hence of course Forge Common. Egypt Bay, the anchorage for some prison hulks from where Magwich might have escaped is in our parish of High Halstow, not Cooling. 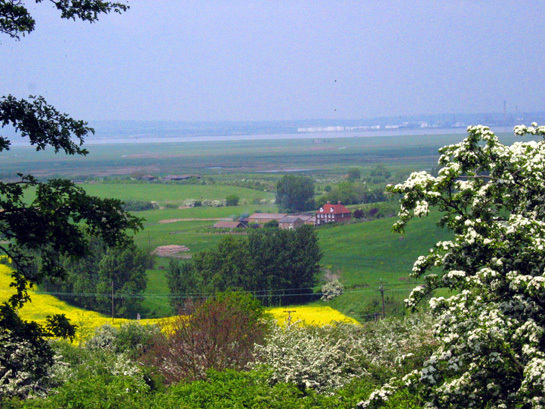 St Margaret’s and Forge Common are on the highest point of a northern ridge way with Stephen Gwilt’s, rectory garden, amongst others offering some of the most magnificent views of the marshes, the River Thames its bays and inlets ( and in those days the prison ships). Although without evidence, either for or against, our parish with its views and history were I suggest a definite must for anyone with Charles Dickens interests. Lastly, anyone visiting our church, St Margaret’s will see in the churchyard, near the church door, the six small lozenges, also of Comport family children . Great Expectations was published in 1860, the last Comport child to die, presumably also of the plague, was interred alongside his brothers and sisters, some two years earlier. Read Charles Dickens wonderful book again. Visit our churchyard and the lozenges of the Comport children, perhaps pray quietly in our small, peaceful but wonderful church, and judge for yourselves. In Loving Memory of Mabel Ossenton. at the Outbreak of War, 3rd September 1939. ‘Killed on way to Duty’ was also a sub headline of the story in the Chatham and Rochester News, in early September 1939, overshadowed by the main headline story, the Declaration of the 2nd. World war. Mabel Ossenton, aged 52, died on her Wedding Anniversary, on the 3rd September, 1939, some 20 minutes or so after the 11 am broadcast of Nevil Chamberlain, declaring the 2nd World War. She may well have been our countries first casualty resulting from a call to duty, following the declaration of that terrible war. Ironic perhaps that this casualty should be a woman, in a civilian defence capacity, of our small village of High Halstow and also probably the first fatal victim of the Four Wents cross road- the junction of Bells Lane and Ratcliffe Highway (the A228). In the Summer of 1939, war was in the air, and civilian and military defence had been organised around our village and area. Civilian casualties from German air attack were anticipated and children from the Medway towns had already been evacuated. Mabel Ossenton, the wife of farmer Frank Ossenton, of Wybournes Farm, answered her call to duty by volunteering as an ambulance driver for the A.R.P. in a post established at Hoo. Her family were well versed to ‘duty’, her dad David Harryman had been the village wheelwright, decorator and undertaker, at the old tythe barn (St. Margarets Court), and her brother, Lieutenant Sydney Harryman had died leading his troops ‘over the top’ in Flanders bloody fields during the 1914-1918 war. Mabel Ossenton was a good, much respected lady, a practising Christian who joined loud and joyfully in the hymns sang at St Margarets Church. That fateful 3rd September, 1939, was a Sunday and George Jewell then a young choirboy recalls Mrs Anne Manning, a lady of Dutch extraction, who lived next to St Margarets, interrupting the service and, white faced and shaking, whispering the news to the Rector ‘Tommy’ Longfield that War had finally been declared. Grace Milner remembers being told by her dad George Billing, who worked for Arthur Plewis, the successor to David Harryman, how after the radio announcement the villagers came out from their homes and Church, and, including Mabel Ossenton, drifted towards the Red Dog where they anxiously congregated in ‘The Street’. Almost within the 10 minutes following the radio broadcast an air raid warning sounded, following the report of an unidentified aircraft approaching the Kent coast. Eight minutes was then the estimated preparation time for Medway, between an air raid alert and possible attack and Mabel Ossenton, responding to her orders and duty, tried to reach her ambulance post in Hoo. She was being driven there by same Mrs Manning when at the Four Went cross they were in a head-on collision with another speeding car. Mabel Ossenton was killed outright, Mrs Manning slightly injured whilst the other driver involved, Mrs Eileen McCarthy, the eldest daughter of Bill Baskin, the feared Head master of High Halstow village school, together with her passenger, an army officer who was hurrying to his artillery battery, received more serious injuries. There was a large funeral service, conducted by the same Rev. Tommy Longfield, whose own son was later killed during the war, with a massive attendance from the village. 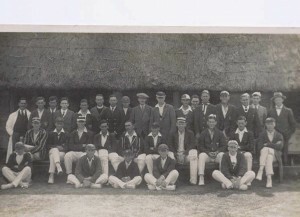 Amongst her other social activities, e.g., member of the High Halstow Tennis Club – does it still exist? and village organisations, Mabel Ossenton was the High Halstow representative of the Friends of St Bartholomew’s Hospital, the patients of which received the many gifts of fruit and produce from the Harvest Festivals. She also organised the annual traditional gift for the poorest family in the village, which was a large well crafted loaf of bread shaped in fine detail like an ear of corn, baked by Messrs. Luckhurst, the bakers in Cliffe. This tradition which probably stopped when there were no more poor in the village!!. could have been a hang over from Mediaeval times when, as a ‘Church Light’, Richard Whitebrede of High Halstow is recorded as donating annual loaves of ‘brede’ to the poor of St. Margarets. Perhaps our own Margaret Whitebread, of Wybournes Lane, should start baking! Was High Halstow The Inspiration? You may recall Harry Lewis Hillier; he was one of the men who returned from the 1st World War and one of those, for whom the Memorial Hall was built. 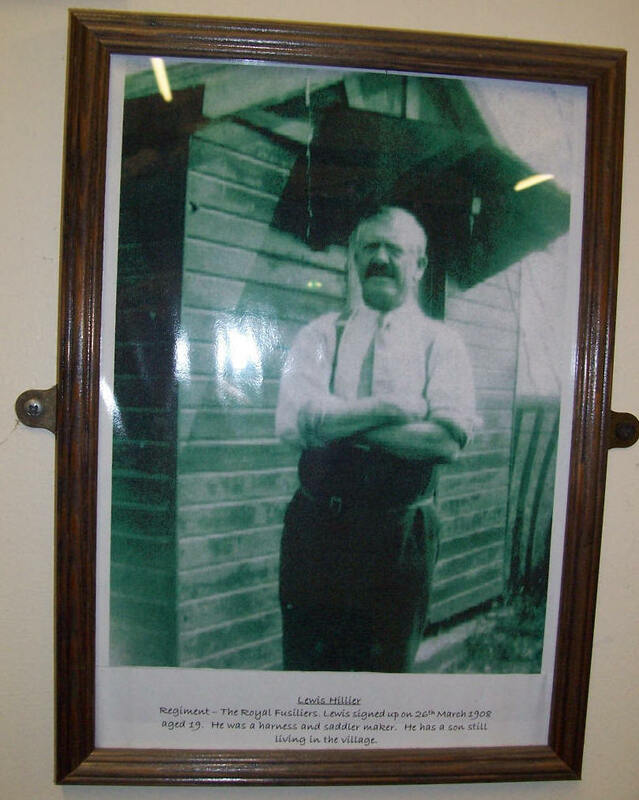 His picture and name along with the others who returned hangs on the wall inside as a reminder, lest we forget. When Harry Hillier (born 1918) was a boy he remembers well, the forge next to ‘Forge House’ was locally known as “Pips Forge” as they thought it to be the forge that was used in Great Expectations. The other forge, the main forge, was in the Square which is now known as Forge Lane. It was owned and operated by Alf Laudle from Cliffe. Mr Plewis the Wheel Wright would make cart wheels in the barn at the rear of Pips forge and roll them down the lane to the main forge in the square where, set in the ground, was large iron plate about inch and a half thick with a hole in the centre sufficient to take the wheel hub. Alf Laudle and his team of two would gradually heat the iron tyre in the large hot forge then pick it up with enormous tongs and hammer it tight to the rim where it would be shrunk with buckets of water binding the wheel together amid great clouds of steam and the smell of burning timber. It was much too dangerous to shrink the tyres on to the wheels in Pips forge for fear of fire as in those days Forge House was thatched. I do not believe in ‘ghosts’ or other manifestations but for candidates we can go back to 1752 when John Grace, returning home after being thrown out of the ‘Dog’ (as the Red Dog was then called) brutally beat to death his long suffering wife Mary Her dying screams and pleas for mercy were heard by passers by who went to the local dignitary at ‘Ducks Court’ to raise the alarm. On finding the battered body of this poor, much abused woman with her young daughter ‘Lizzie’ sobbing nearby’ a hue and cry was raised and John Grace was captured before he could escape from the peninsula. After pleading guilty at the Maidstone Assizes he was hung and his dead body left to rot in chains on Hoo Common until the carrion fowl of the air had picked the flesh away. Poor Lizzie never married, she died in her twenties and was buried at St Margaret’s churchyard. Are these so called ghosts the spirits of John, in his misery seeking redemption for his brutal deed; Mary re-living the agonies of her last agonising moments or poor Lizzie who was left terrified and orphaned, still seeking her mum and the only love she ever knew. It is believed that the Grace’s had lived in a cottage on the Street, near Christmas Lane,. Who lives on that spot now we wonder. For other possibilities perhaps we can go back to 1348 and subsequent years when the Black Death hit our area particularly hard. It is estimated that some 70/80 inhabitants from the hamlets of High Halstow, might have been our death toll from this virulent pestilence. The plague knew no boundaries or class barrier. Rich and poor alike were taken. Those clergy that did not ‘run’ ( and that could not always save them) perished with the rest and there was no-one left to perform the last Christian rites. Our Bishop ran (sorry retired) to his palace at Aylesford and did survive although nearly all the priests of his household, and those left behind to manage the ‘see’ also perished. Consequently, at High Halstow, like other villages in the County , we had nobody to bury the dead or even at St. Margaret’s churchyard room for their burial. The remedy was plague pits. All were interred in the same spot, to be blessed later with the rites of the church. But where was ours at High Halstow?. If it was communal for the village than it should be central to all our hamlets of the Street, Sharnal and Clinches etc. On common or waste land that was not good prime soil for crops .. We might have some clues from ancient deeds which for centuries now have referred to an area translated as ‘Dead Mens’ although at the present not sure of the location, it is suspected it was not too far down the road from the memorial hall. I do not believe in ghosts, manifestations or other such silliness, but an example of how such superstitions can arise might be found in our ancient church St. Margaret’s. A couple of years ago I was chatting to an old chap I met in the churchyard who had returned to the village to visit some graves. He mentioned to me a story he had apparently heard in his youth of the outline of a face of a ‘suffering’ man which re-appeared from time to time in various places on the wall of our church, but could only be seen by a righteous woman, never by a man, unless he was shown the same by the ‘righteous’ woman. My acquaintance had never seen the face himself but then apparently had not been married at the time. We joked that the superstition could have something to do with St. Margaret, the patron Saint of pregnant women, so that a wife could prove to her husband her ‘righteousness’. Later, during sermons (sorry Stephen) I obviously looked around the church but never saw any such face. A few months ago I mentioned this story to my wife who sometime later, again after a morning service, said look, there is a face there, and pointed out to me marks and cracks in the plaster from which I could then clearly make out the tired or haggard face of a bearded man, with what seemed to be a Celtic type cross above. I emphasise again this was no manifestation but merely an imagined experience deduced from accidental marks found in decaying plaster. The coincidence is only that I have never been able to point this face out to a man myself, it is only, to date , their wives who have had this ability. Coincidence? it must be, and one day the superstition will be disproved, although as my own good lady Denise says, men really only see what their wives want them to!.